I had hoped to post more often on this blog, but this term has been unusually busy. There have been a lot of great opportunities and many exciting projects are in the pipeline, but time has flown and here we are, just before Christmas, with no blog post since the summer! I’ve been more active on Facebook, Twitter and LinkedIn – the necessity for brevity required in social media has helped! Here’s a quick catch-up, then, and some thoughts and musings on my research and other activities this term. First of all, I was delighted to work with the BBC last summer to film two iWonder online guides on J.R.R. Tolkien. The first one, released in September, was on Tolkien’s experience of World War I and how it may have influenced The Lord of the Rings. 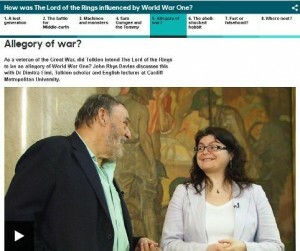 I was interviewed by John Rhys-Davies (who played Gimli in The Lord of the Rings film trilogy) about whether The Lord of the Rings can be considered as an allegory of WWI. This short video forms Part 5 of the iWonder guide, which was one of a series of similar online guides produced to commemorate the centenary of WWI. The second guide, which I presented, was filmed last July in a number of locations in Wales. Fittingly it focuses on Tolkien and the Welsh language – his love of Welsh, his use of Welsh in the construction of Sindarin (one of the languages of the Elves), and the Welsh place-names in the Shire. This iWonder guide has just been released today and I am thrilled with how it’s has all come together! Readers who may want to know more about Tolkien’s ‘Celtic’ inspirations (Welsh and Irish) can access my articles under Publications. Why do the Elves in The Hobbit sound Welsh? During the last few months I also reviewed two of Tolkien’s recently published books (well, one and a third, to be precise!). The first is a review of Tolkien’s The Fall of Arthur (2013) for Gramarye: The Journal of the Sussex Centre for Folklore, Fairy Tales and Fantasy. My review is aimed at both Tolkien specialists as well as scholars in the more general fields of fantasy literature, folklore, etc. The second is part of a joint review by a number of Tolkien scholars of Tolkien’s Beowulf translation (2014). My bit is a review of “Sellic Spell”, Tolkien’s attempt to ‘reconstruct’ the Anglo-Saxon folktale that may have inspired motifs and the wondrous elements in Beowulf. This collective review will be published soon in Mallorn, the journal of the Tolkien Society. Last but not least, I also contributed a piece to The Conversation, an independent source of news and views sourced from the academic and research community. My article was titled: “Enid Blyton’s The Faraway Tree to hit the screen in latest bid to aim fantasy at grown-ups” and offered views on the recent success of cinematic adaptations of classic children’s fantasy.